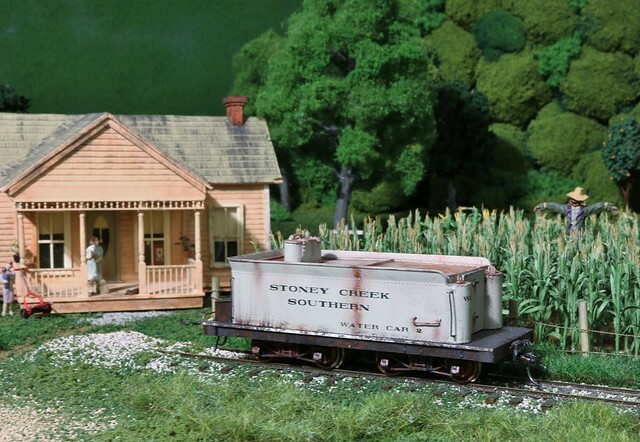 Freerails > Model Railroad Forums > Dioramas > Build Scenes On The Layout ... Or As A Diorama ? Build Scenes On The Layout ... Or As A Diorama ? I'm doing most of my scenery on the layout, then came up with a thought or question. The structures I of course built up, then put on the layout. The rest of the scenery went in as I was building it. I noticed from a camera run through there but you can't see it from the aisle). Everything is done right on the layout. I seldom do much in the way of planning. Even when I do some kind of planning I generally make changes along the way. Even with scratchbuilding I have some rough dimensions and just go from there. I build my buildings and large items like that as dioramas and then install them on the layout. I build other scenes and the overall scenery on the layout. 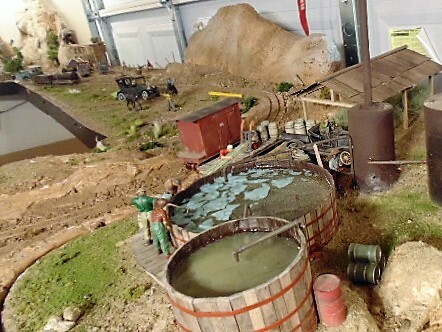 I built this wax "factory" as a diorama which was then placed upon an area inside my "hairpin curve" on the layout. You can see the edge curving around on the left, this has been "covered up" with dirt & rocks & some green stuff. I didn't build the wax factory to be installed on the layout but decided that it needed to have somewhere to "live". So I scraped the scenery off the inside of the curve and stuck it down. This has become an operational feature since it has a small loading dock next to the main line...the boxcar is sitting there at the moment. 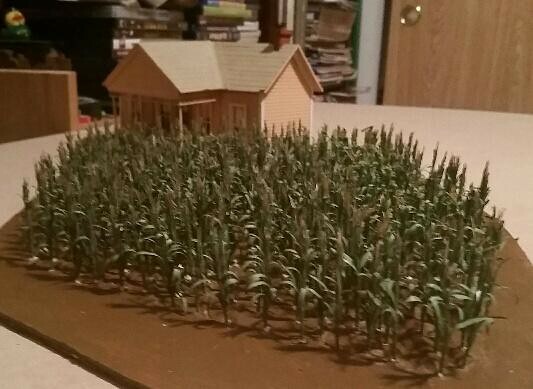 Soooo, sometimes a diorama can become part of the layout, simply because there is no other place to store it. Well I think any buildings I'm going to do diorama for any buildings. In fact the first one should be the lumber mill and yard. That scene is really coming together! Nice work! Would you,please, tell how you make those great corn plants? This end of the layout is looking pretty nice already. Nice idea doing the 'wireframe' of the building to check things out. It looks surprisingly effective as a way of eyeing stuff up. What computer program did you draw the 'wireframe' with ?